The Wilmington Air Park is a public use airport employing a prior permission required (PPR) format to monitor air traffic. Landing and parking airport fees vary depending on the class of aircraft and the length of stay (daily or monthly). Ground support, security and other support services are also available and fees vary depending on individual needs. 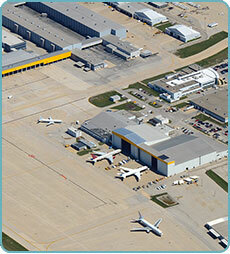 The airport has Jet A fuel for sale and does allow aircraft of any size landing opportunities. Rental car service is close by and can be arranged ahead of time. Please click the link below for a full menu of available services and associated fees.